This coming September, the New England AUA will be meeting at the Bonaventure Hotel inl Montreal, Canada. Our meeting will be taking place from September 7th - 9th, right before the Society of Pediatric Urologist Fall Congress, from September 8th – 10th. Given this unique arrangement, we have been able to attract more pediatric urologists by encouraging submission of abstracts to both meetings. This year, we have a record number of 168 abstracts to choose from. This scientific program promises to be the best ever, covering topics from cancer, to stones, to pediatric urology to transitional care. Our scientific program co-directors are Dr. George Haleblian and Dr. Alex Vanni. With their expertise and input, the state of the art lectures and Leadbetter lecture will have something for everyone. In addition, by offering a 1-day rate for members wishing to attend both meetings, we should have more attendees than in the past for "out of section" meetings. Montreal promises to be a great meeting place, with history and scenery and restaurants enough to please everyone. Learning about the issues was half the battle; learning all the abbreviations was like learning a whole new language. From welcome notes by Dr. Charles McWilliams, President of AACU and Dr Richard Babayan, President of the AUA to UROPAC update from Dr. Jeffrey Frankel, to closing details and logistics by Dr. James Ulchaker, the three days were truly eye opening. There were 165 attendees from across the United States. 21 members were from our own NE Section and 13 attendees were from Massachusetts alone. Also in attendance were the 2017 JAC Essay Winners: Dr. Alexander Cole and Dr. Matthew Mossasnen, both from the Harvard/Brigham and Women's programs. For such a small Section, we were certainly well represented. On March 18th, the Board of the NEAUA met in Gloucester, MA at The Beauport Hotel. In addition to our "experienced" state representatives Leslie Rickey (CT), Lindsey Kerr (ME), Anurag Das, (Western MA), Jennifer Yates (Eastern MA), and Kevan Sternberg (VT), we welcomed Martin Gross (NH) who is stepping in for Elias Hyams. Dr. Stephen Schiff is completing five years as Secretary with Dr. Vernon Pais in line to become Secretary in September. Also in attendance was Dr. Arthur Tarantino, President Elect, Dr. Gregory Adey, Treasurer, Dr. Karim Hamaway, Historian, and Drs. Ann Gormley and Kevin Loughlin, Representatives to the AUA. This was a very robust meeting, with discussion about the upcoming NEAUA program, Corporate Member recruitment plans, positive financial reports, and ongoing updates to the NE AUA policy document. And not to be forgotten, an enlightening update on the history of the Beauport Hotel, which according to Dr. Tarantino, used to be a Bird's Eye frozen food factory. Who knew? Finally, I would like to remind everyone that the AUA is meeting in Boston this coming May. With our own Dr. Richard Babayan as President of the AUA, we hope to guarantee a good showing by the NEAUA members. In addition to an impressive and rigorous scientific agenda, there is also the social and resident activities to look forward to. The New England Section will be sending Dr. Kevin Koo from Dartmouth and Dr. Maddie Cancian from Brown to the resident debate. Participants in the resident Bowl will be Dr. Keyan Salari, Dr. Anton Winter, Dr. Scott Wiener, Dr. Urszula Kowalik, Dr. Shu Pan, Dr. Eric Raffin and Dr. Brandon Browne. Join me in cheering them on and wishing them all the best of luck in their upcoming competitions. I look forward to seeing everyone at our upcoming meetings. And I welcome and encourage everyone to become involved and stay active in the AUA and NEAUA. Figure 1. The Uroscopy Wheel. Technological advances in the field of medicine have placed urologists in an environment awash with sophisticated laboratories and robotic surgery, but this was not always the case. In fact, for European physicians during the middle ages, most of their evaluation and treatment algorithm was based on close examination of urine, a practice termed uroscopy. Urine has long been recognized as a marker of health. 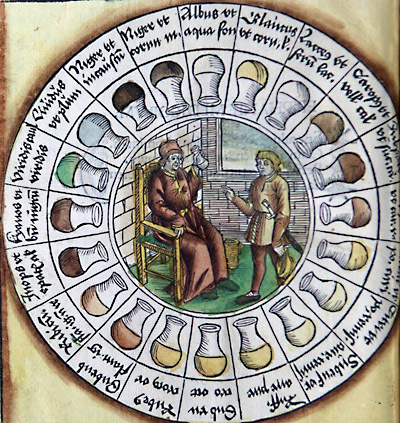 As far back as Hippocrates, the evaluation of color, sediment, and other characteristics of urine were refined into a highly sophisticated means of diagnosis. This information was consolidated into a diagnostic chart called the uroscopy wheel. Twenty-one colors of urine were organized into a circular chart with a poetic description of the hue (e.g. 'white as well water' or 'red as oriental saffron') (Figure 1). Each color, in turn, corresponded to the patient's heat of digestion and reflects their pervasive humor (sanguine, choleric, melancholic, or phlegmatic). Additional conditions could be determined based on the presence of sediment or bubbles in the urine, which could diagnose pregnancy, tumors or jaundice among others. Using this chart, the uroscopist could then prescribe the appropriate remedy. The practice of uroscopy was the most trusted medical science of its era and was taught in all of the early medical schools in Europe at the time. It reached a level of renown in the middle ages such that the matula (a clear glass flask for urine examination) was recognized as the symbol of a physician, similar to the stethoscope in the current era. However, the advent of the printing press in 1440 allowed easy reproduction and dissemination of the uroscopy wheel. This tool subsequently spread beyond physicians and was used (and abused) by midwives, amateur healers, and quacks. The accuracy of uroscopic diagnosis (which to current physicians may appear dubious even in the finest of hands) began to quickly deteriorate. Simultaneously, medical schools were turning to anatomic dissection for understanding the human body with less instruction in uroscopy. These events lead to uroscopy's eventual demise, although it was used in its original form well into the 19th century. While it has fallen from favor as the preeminent diagnostic tool of physicians, careful examination of urine still provides invaluable information for diagnosis of infections, characterization of calculi, and early warning of genitourinary malignancies. Multiple diagnostic algorithms exist describing the odor, consistency and color of urine, a modern version of the uroscopy wheel without the artistic flare. Although we are constantly barraged by a variety of sophisticated urine markers (with more developed every year), we should never abandon the art of direct observation and its relevance to clinical medicine. and for reporting to AUA Sections. The Pre-Announcement for the new Urology Care Foundation Physician Scientist Residency Training Award is now available. This pilot program will support a three-year research training program embedded within residency and will open in May 2017 to all urology residency programs wishing to apply as a Program Site. Approximately three Program Sites will be selected through a rigorous peer-review process and approved to participate in an early, special residency match program to fill the initial trainee position. Medical students will be invited to apply for the available trainee position in the summer of 2018. Learn more. 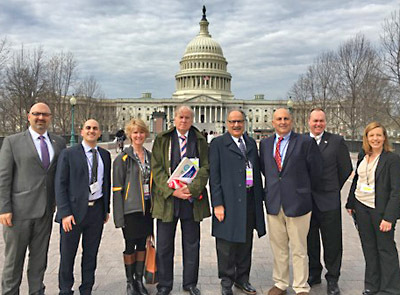 The New England section of the AUA was well represented during this month's Joint Advocacy Conference (JAC) in Washington, DC. The conference brought together dozens of urological leaders from both academia and practice, from across the United States. The New England section saw representation from all six New England states and from a variety of practice types, with urologists from throughout the spectrum of their careers, including trainees such as us. The program included educational offerings on a variety of thought provoking topics of interest—ranging from policies and strategies to prevent physician burn-out, legal and practical aspects of telemedicine to highly engaging discussions about the new merit based payment system being used by Medicare. From a legislative perspective the conference included a day spent "on the hill" where we advocated for three issues of interest to practicing urologists: One was passage of a bill to encourage the United States Preventative Services Task Force (USPSTF) transparency and accountability in the wake of the 2012 blanket recommendations. In the days following the urologists' visit to the hill, two congressmen joined this bill, H.R. 539 as co-sponsors. A second legislative "ask" was repeal of the Independent Payment Advisory Board (IPAB)—which is an arbitrary cut in Medicare reimbursements expected to trigger in the coming year if specific payment targets are not met. In the two weeks surrounding the JAC conference, 18 members of Congress joined this bill as co-sponsors while two senators joined corresponding bills in the Senate. 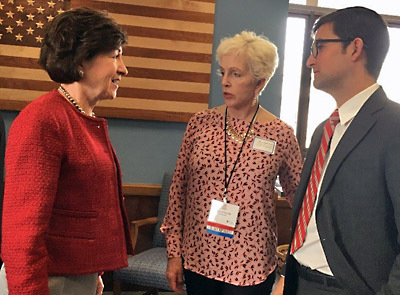 Lindsey Kerr (Urologist, Bangor, ME) Alexander Cole (Urology Resident, Brigham and Women's Hospital) meeting with Senator Susan Collins of Maine. 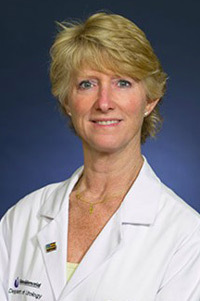 Finally, the third and final legislative priority was to revise several of the most onerous requirements of the Medicare Access and Chip Reauthorization ACT (MACRA) implementation including asking regulators to remove the all-or-nothing compliance requirement for the ACI performance category, maintaining 90-day ACI reporting requirement beyond 2017, and to make Adoption of 2015 CEHRT voluntary. In closing, the meeting provided valuable experience and we highly recommend making an effort to attend for several reasons. As researchers and trainees, we had a personal and academic interest in these topics. But as urologists ready to embark on our careers, we understand that healthcare coverage plans have continued to evolve in complexity; policies will have a very real impact on our ability to care and advocate for our patients. What's more the meeting is a great opportunity to network with a diverse group of friends and colleagues from around the country. Understanding a bit of the "inner workings" of the capitol was the icing on the cake, as we a both avid political spectators. Regardless of where the future takes urology, attending the JAC is a great environment to learn about health policy, advocate for our patients, and support the field of urology. Based on a partnership between the New England Section of the AUA and the American Association of Clinical Urologists (AACU) this item provides updates on legislative processes and issues affecting urologists. We welcome your comments and suggestions. Contact the AACU government affairs office at 847-517-1050 or info@aacuweb.org for more information.